Home » Jewish Moms » Dear Debra: My Kid is Driving Me Crazy! Dear Debra: My Kid is Driving Me Crazy! 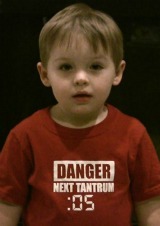 My 2-year-old is incredibly stubborn. The power struggles are constant, especially during the afternoon/bedtime. Any suggestions how to get my son to be more cooperative? For moms of young children, the whole bedtime routine can at times be a pleasure and at other times an outright battle. Here are some tips to making your afternoon/evening with your young child not only pleasant but actually FUN! Call out a color and your child (or children!) has to pick up all items in that color. For example, call out red and your child has to put away all items that are red. Tell your child that he can be an animal while in the bath. Do you want to be a fish? Come in the bath and I’ll tell you how to be a fish. And then you can show the child hand motions to make while you start soaping him up and then sounds to make, etc. The key is to get him in the bath and then show him the hand motions and sounds, as a distraction, while you are soaping him up! By the time you finish showing him how to be a fish, you should be done with the bath already! Have your child stand in front of you. You then call one item at a time which they have to take off. For example: right shoe and then left shoe and then one sleeve, pants/skirt, one sock, etc. To be funny, you can say their sock while their shoe is still on and things like that. Now for the fun part – have them take off parts of their body as well! In between articles of clothing, call out parts of their body and put out your hand for them to put them into. Now take off your nose. Now give me your belly button. Come on, say goodnight to your belly button. Pretend to collect up different body parts and put them away to save for the morning. The opposite can be done for getting dressed in the morning. Call out one article of clothing to put on at a time and pretend to pull out body parts which you then hand out to put on as well. Do you want to jump to bed or fly to bed? Do you want to crawl to bed or hop to bed? Do you want to hop like a bunny to bed or slither like a snake to bed? Debra David is a Life Coach for Moms. She partners with women in a thought-provoking and creative process, helping them feel good about themselves and motivated to create the life they desire. As a mom to 4 lively young children, Debra strongly identifies with her clients as to the daily struggles and many responsibilities mothers are challenged with. Clients leave feeling empowered and inspired to maximize their potential and get their own needs met in order to truly give to others. To learn more about Coaching for MOMS or to receive FREE Mommy Tips to your inbox, visit her website at www.EmpoweringEmas.com. Cute and fun ideas, but not always practical particularly for a tired 2-year-old who doesn’t know colors yet/is not verbal enough to really understand what’s so funny about these games. Also, at least my 2.5-year-old is the master of procrastination. If I fly him into bed, he will insist in flying at least 7 more times until moving on to something else (with much persuasion and sternness on my part and some yelling on his part…). Then he will make the flying a required part of his bedtime routine and we will have to negotiate how many times it will happen, just like we are constantly negotiating how many books to read, how many songs to sing, how many kisses he gets before I leave etc. etc. etc….. These fun ideas are great, but they don’t address the heart of the issue. If the mother would understand that the child is going through a normal and CRUCIAL developmental stage and not trying to make her life difficult, she’d have an easier time managing the situation. Distractions are nice once in a while, but they prevent the parent from cultivating the child’s understanding of parental authority. I think it would be much more helpful to teach the parent how to develop this authority without going into a power struggle.